Bob is primarily a road bike rider, and he bought his Giant Defy Advanced 1 in April of 2011. He originally had a Giant Defy Alliance, which has a mixed carbon fiber/aluminum frame, but for the long, fast rides that Bob likes to do, he figured that he should upgrade to a full carbon bike in order to take advantage of the lower weight, higher speed, and performance benefits that it would provide. But the two things that he likes the most about it are the cool styling, and the fact that it's a very comfortable bike. 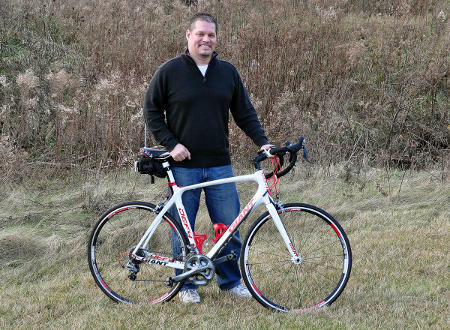 Bob enjoys riding in the Cleveland Metroparks, and he also took his new Giant bike on this year's Bike MS Pedal to the Point ride. It's his favorite ride because of the variety of terrain and conditions it provides to test his skills and endurance. It's also for a good cause, of course, which Bob has helped to support for over 15 years! Bob started doing the ride on a 1980's Raleigh Peak mountain bike, and he says switching over to lighter and faster has definitely made a huge difference. Click here to see what else the staff at Century Cycles rides!